From the times of feudal service, though regaining independence in 1918 and World War II, to the era under the communist regime and now today – the story of Poland is narrated by selected works of art from the exhibition Late Polishness: Forms of National Identity after 1989 at the Centre for Contemporary Art at Ujazdowski Castle. The compulsory work of peasant-tenants for master-landowners occurred on Polish land from the 12th century to 1864. Serfdom had been gradually fading in the West since the 15th century and had become an anachronism by the 18th century. Around the same time in Eastern and Central Europe, the trend was reversed: feudal commitments were becoming increasingly severe. Artist and activist Daniel Rycharski created a metalwork gate for the 150th anniversary of the abolition of serfdom. Its inauguration took place in the small town of Kurówko in Mazowsze in 2014. Rycharski also created other works for his hometown, including a series of dozens of murals painted on barns, sheds, and bus stops, thanks to which he was hailed as the creator of rural street art. He also initialled the ‘Gallery Chapel’ – a place of worship of contemporary art in which artistic projects are presented. Poland, as the most tolerant country in Europe, accepting expelled Jews from other countries, protecting their safety and interests? This was a reality for several hundred years – thanks to the decisions of Kazimierz the Great in the first half of the 14th-century. At the beginning of the 20th-century, Poland was home to the largest Jewish diaspora population in the world. After regaining independence in 1918, Józef Piłsudski envisioned Poland as a multinational and multi-religious country. This paradise ended definitively following the mass exterminations committed by Nazi Germany. Most of the Jewish population that survived and did not leave immediately after World War II were forced to emigrate in the late 1960s by the communist regime. Israeli artist Yael Bartana tries to reverse this tragic story. In her film trilogy And Europe Will Be Stunned, she established a fictional Jewish Rebirth Movement, which aims to return over three million Jews to the homeland of their ancestors. The emblem of the Movement is a symbol linking the Star of David with a white eagle, and its first congress was held at the Berlin Biennale in 2012. The trilogy, which premiered at the Polish Pavilion at the 54th Venice Biennale, includes the works Nightmares (2007), The Wall and Tower (2009) and Assassination (2011). One of the most heroic moments in Polish history is referenced in the project Impossible Objects by Jakub Woynarowski and the Institute of Architecture: Dorota Jędruch, Marta Karpiński, Dorota Leśniak-Rychlak and Michał Wiśniewski. Its main feature is a replica of the canopy from the entrance to the crypt at Wawel Castle, where Marshal Józef Piłsudski is buried. Piłsudski is a symbol of Poland’s regaining independence and was a visionary of a multi-religious and multinational country. The work – presented for the first time at the Polish Pavilion at the 14th Biennale of Architecture in Venice – concerns the complex relationship between modernism and politics in the post-1918 Polish state. Modernity as an object of national ambition and an element of international aspirations, neighbouring an appeal to tradition – the intricately built historical myths, the figure of resurrection and victorious defeat. The official funeral rites, the cult of relics of the holy national – military leaders and poets, the myth of the existing and non-existing state – they all serve Poles as the foundation of their precarious identity. The attitude of Poles towards modernity is as complex as the concept of modernism is ambiguous. Dorota Nieznalska, I Am Polish, Thus My Responsibilities Are Polish draws its name from the political writings of Roman Dmowski, the father of Polish nationalism. In the work, the artist reveals her kinship with Dmowski, a spiritual leader among the right-wing so often outraged by Nieznalska’s work. A series of photographs shows Nieznalska laying a wreath of Polish rye and a Polish scarf at the grave of her ancestor Dmowski at the Bródno Cemetery in Warsaw. She is also pictured in Sopot at the grave of her great-grandmother Rozalia, née Dmowska. In her works, for several years Nieznalska documented and submitted to critique examples of hate speech in public spaces. One of her points of interest were the aggressively racist and anti-Semitic slogans, appearing among the football hooligan communities. The rhetoric of the hooligans, which fits into the phenomenon of symbolic violence, is not distant from nationalistic attitudes of far-right organisations. The artist points to the social mechanisms forming the favourable conditions for hate speech and its advancing popularisation, not only at football arenas, but also in politics. 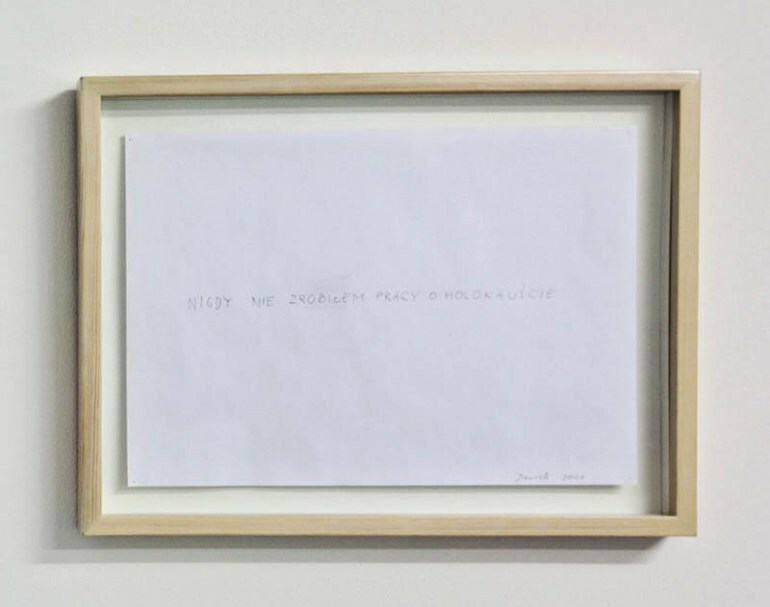 Oskar Dawicki’s work consists of one sentence written in pencil on A4 paper: ‘I never made a work on the Holocaust’. The drawing was created as part of the project Próżna, held on Próżna Street during the Singer’s Warsaw Festival of Jewish Culture. I Never Made a Work on the Holocaust can be understood not only as a piece on the Holocaust, but also as an important declaration regarding the instrumentalisation and trivialisation of tragic topics by some artists. (…) Dawicki mentions in one of his interviews that the inspiration for I Never Made a Work on the Holocaust came from a conversation with Zbigniew Libera on shallow and embarrassingly bad ‘Holocaust art’. Wilhelm Sasnal is one of the artists invited by the Warsaw Uprising Museum to create a mural on the wall of their rose garden. Other contributing artists include Edward Dwurnik, the Twożywo Group, Galeria Rusz and Przemek ‘Trust’ Truściński. Sasnal painted yellow pansies on a black background – flowers, the shape of which is reminiscent of skulls. The museum also released a series of refrigerator magnets, t-shirts, notebooks and pen drives with reproductions of the mural. This can be considered the most prominent contemporary art contribution to the reconstruction of the mythology of the Warsaw Uprising. On the 40th anniversary of Kazimierz Dejmek’s censored 1968 production of Mickiewicz’s Forefathers’ Eve, Krzysztof Wodiczko revived Adam Mickiewicz by projecting the poet’s words onto his Warsaw monument. In his work, Wodiczko often deals with the problems victims and people on the margins of society, as well as the traumatic ballast of history. Anti-Russian content and allusions to the situation in the country at the time led authorities to suspend the 1968 production of Forefathers’ Eve. After the last performance on 30th January 1968, protests broke out at the Adam Mickiewicz Monument on Krakowskie Przedmieście with the aim of restoring the show. Subsequent attempts at protests and the reactions of authorities led to the outbreak of the student strikes at the University of Warsaw on 8th March 1968. Peaceful rallies were brutally suppressed, which led to further student protests across the country. One of Krzysztof M. Bednarski’s most famous marble sculptures is Victoria-Victoria – a symbol of social sentiment in Poland during martial law. The hand – raised in a gesture of victory, but with its fingers cut off – was created in 1983. At that time, the work was very legible political commentary. Just after the period of martial law in Poland, it reflected the failure of the Solidarity movement. On the 20th anniversary of the first free elections, the artist prepared a new version of the sculpture: the severed fingers appear to have been regenerated – thanks to a projection onto the sculpture. What is the fate of the icon of contemporary Polish history – Solidarity? In the 1980s it was one of the main centres of opposition against the communist regime. Grzegorz Klaman deals with the romantic myth of Solidarity in his installation, which recreates the iconic logo with 4,000 toy soldiers produced in China. 4th June 1989 is the symbolic end of communism in Poland and marks the emergence of a free democratic state. On the 20th anniversary of the first free elections in post-war Poland, Paweł Althamer organised Common Task, an action in which he and his neighbours from Bródno donned golden suits to board a golden plane to Brussels. Artist Jacek Adamas was among those invited on Althamer’s flight. His work is critical of the Polish transformation and neoliberal capitalism. Untitled modified the photo of Common Task , which had appeared on the cover of the prestigious magazine Arforum. Adamas added the wreckage of 2010 plane crash in Smoleńsk to the image of the participants on the airfield. When spread out, covers facing up, Artforum suddenly becomes an indictment of domestic realities, juxtaposing images that symbolically represent two Polands: the one living its post-1989 success, the other living the tragedy of the transformation. 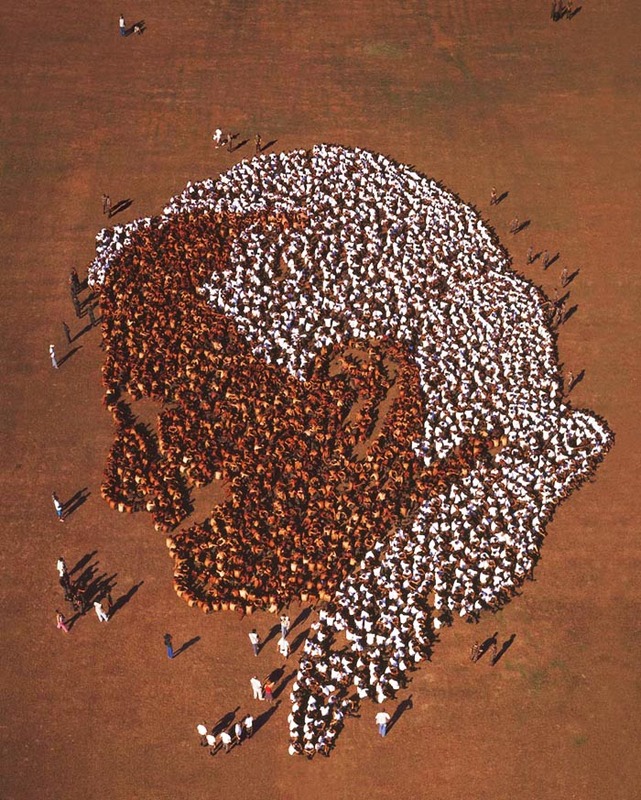 This monumental photographic portrait of Pope John Paul II was created during an action organised by Piotr Uklański in Rio de Janeiro for the São Paulo Art Biennial in 2004. About 3,500 Brazilian soldiers participated and were posed by the artists to depict the head of the Holy Father. In 2005, a billboard with Uklański’s photograph was installed at the intersection of Marszałkowska and Świętokrzyska streets in Warsaw. Two weeks after the image appeared, John Paul II died. The billboard became a memorial site where mourners left candles and flowers. The crash of the TU-154M in Smoleńsk on 10th April 2010 was not only the second biggest air crash in Polish history, but more significantly, it left the country without a president and almost one hundred members of state. Artur Żmijewski, in the early days after the catastrophe, walked streets of Warsaw and filmed people as they tried to make sense of the catastrophe. With his camera ready at hand, the artist took to the streets of Warsaw in the days that followed the ill-fated flight, documenting unfiltered public response to the trauma, while wandering through demonstrations, vigils and common prayers. Although the catastrophe itself quickly became a matter of political dispute, Żmijewski is far from taking sides. Keeping his distance, he is simply watching the rituals, listening to people talk about the crash, observing the society struggling to articulate this collective shock.